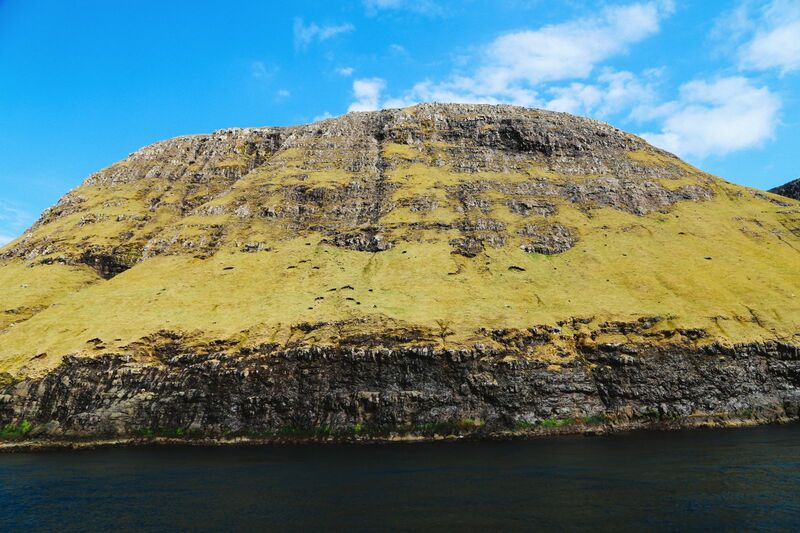 As you might remember, we were rather late leaving the cliff side lake of Sørvágsvatn and pretty much had to hot-foot it across the islands to Vestmanna where we had an island tour via boat. 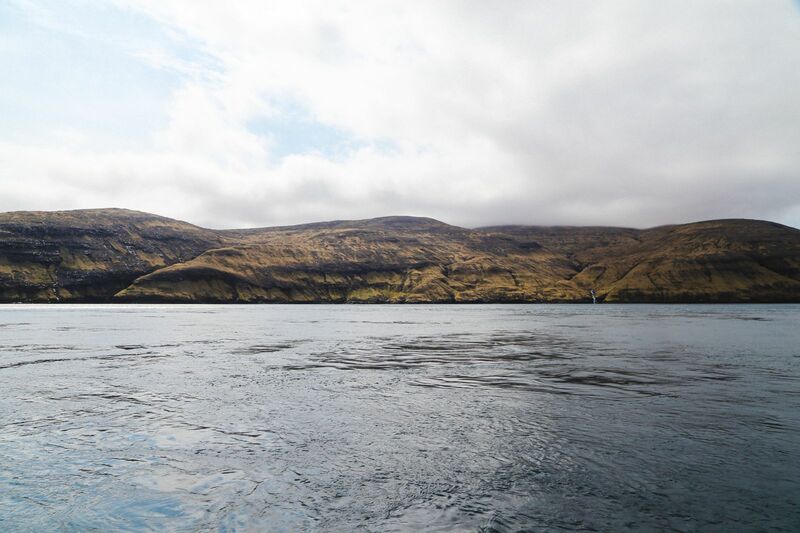 We made it barely on time (like with 3 minutes to go) although, the guy on the phone we’d spoken to, to inform the team that we would be late was absolutely relaxed. 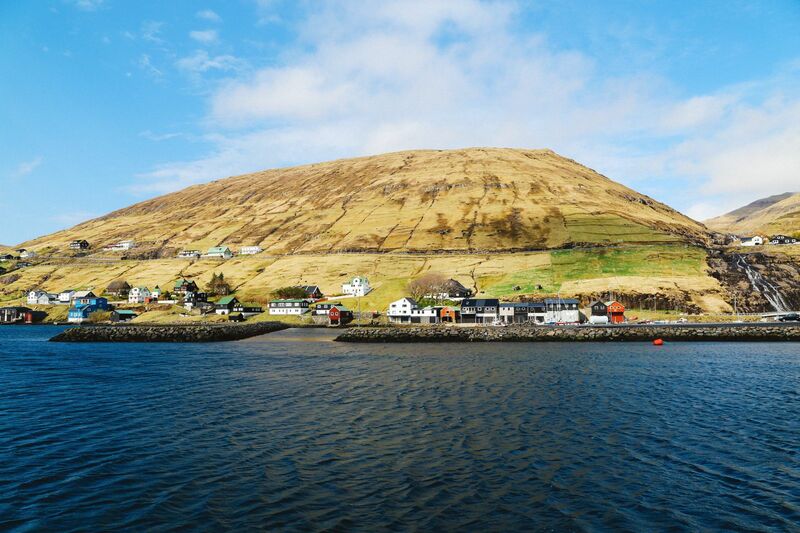 Island life is very chilled and laid back, which made us reflect on how manic and crazy London can get you! 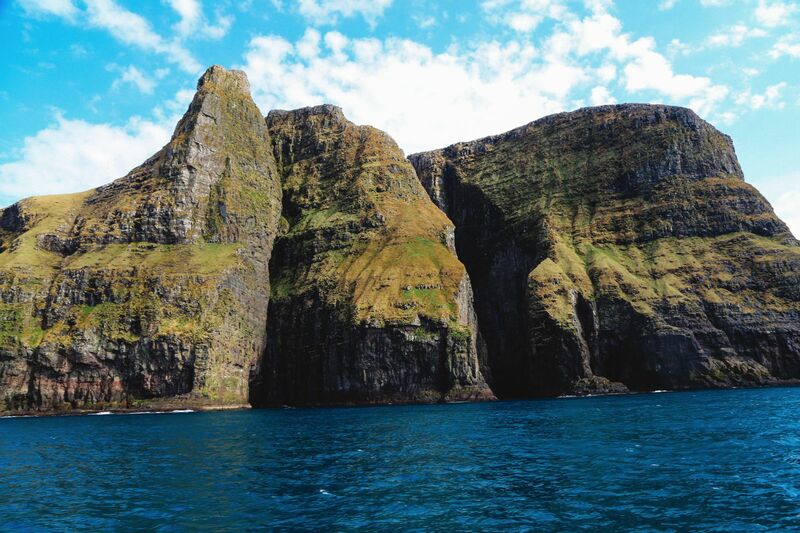 The thing is the tour was meant to be a bird cliffs tour but quite frankly, I paid very little attention to the birds that we did see and you’ll see why shortly. 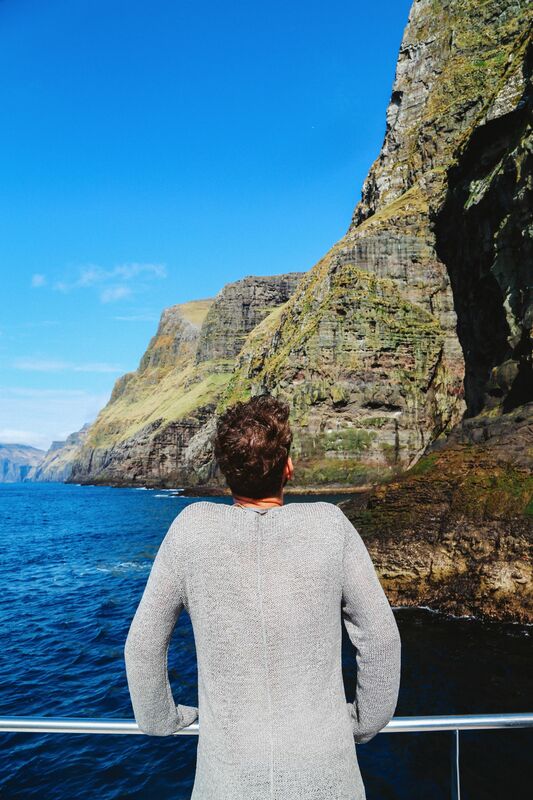 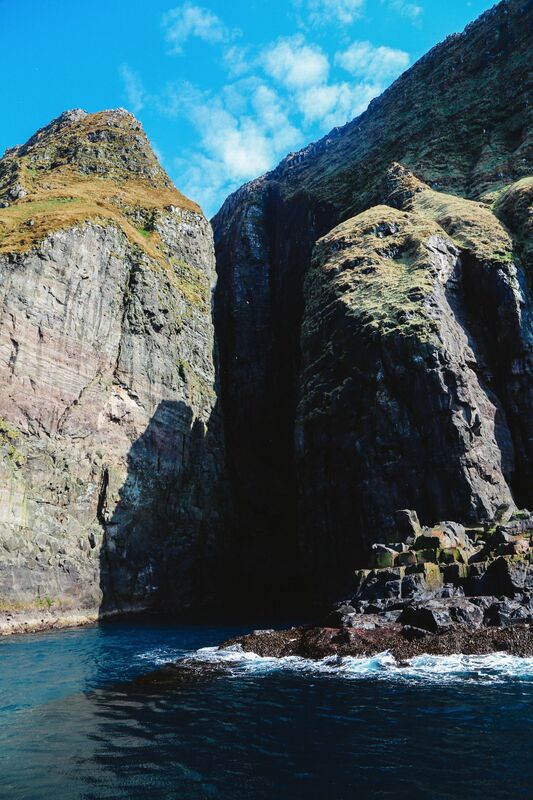 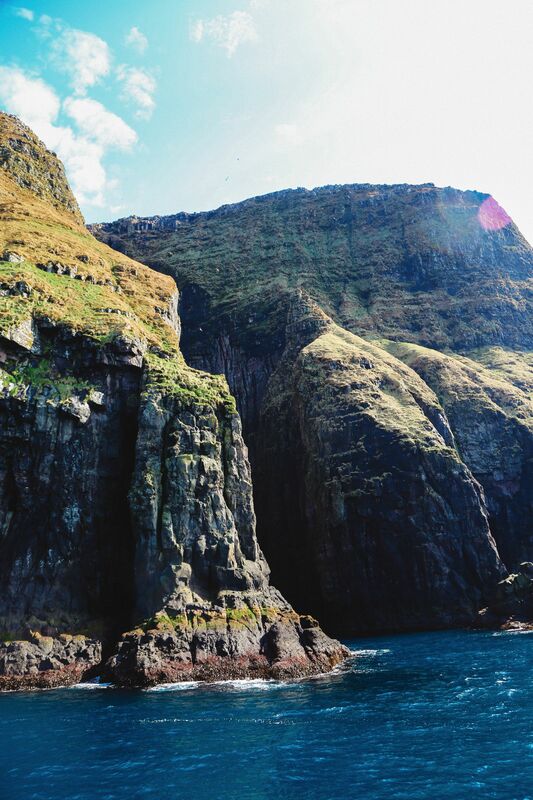 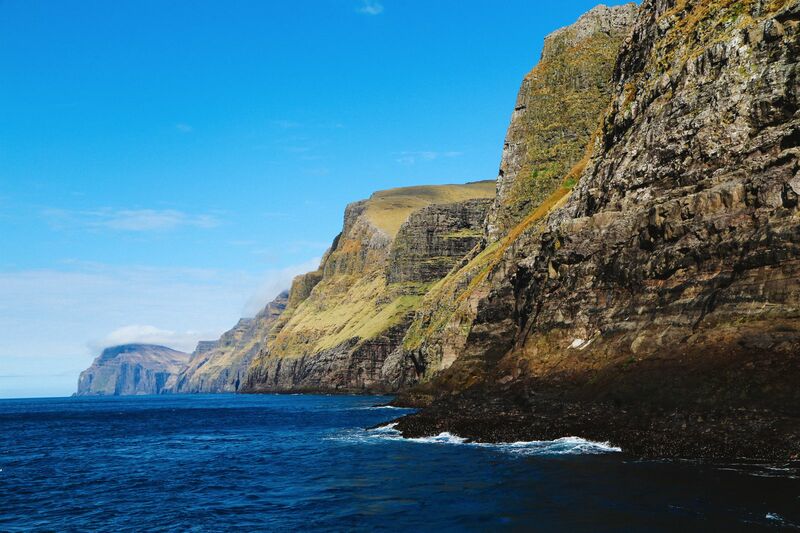 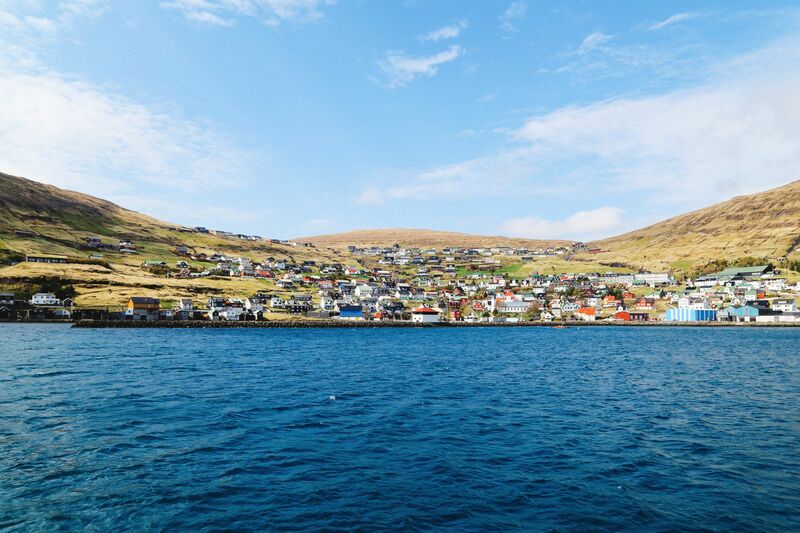 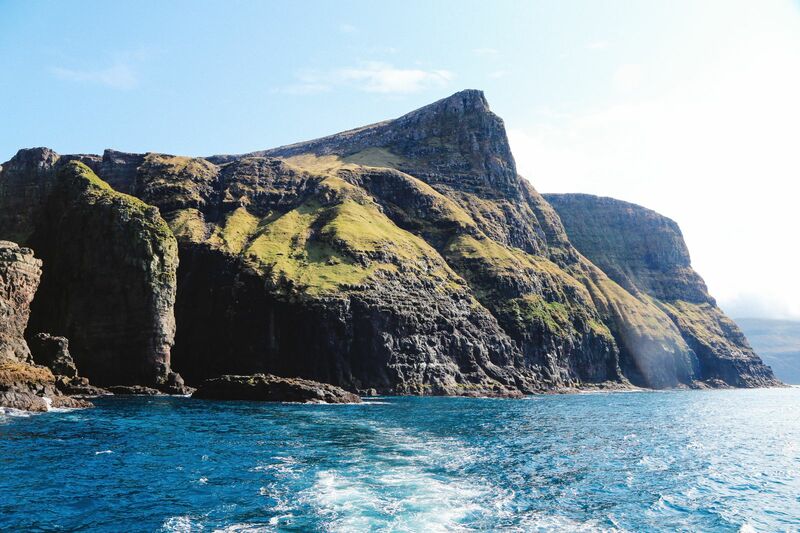 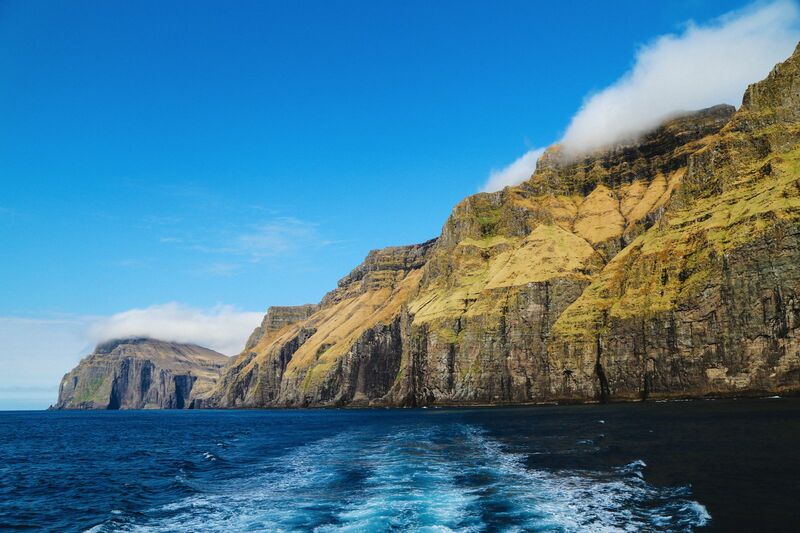 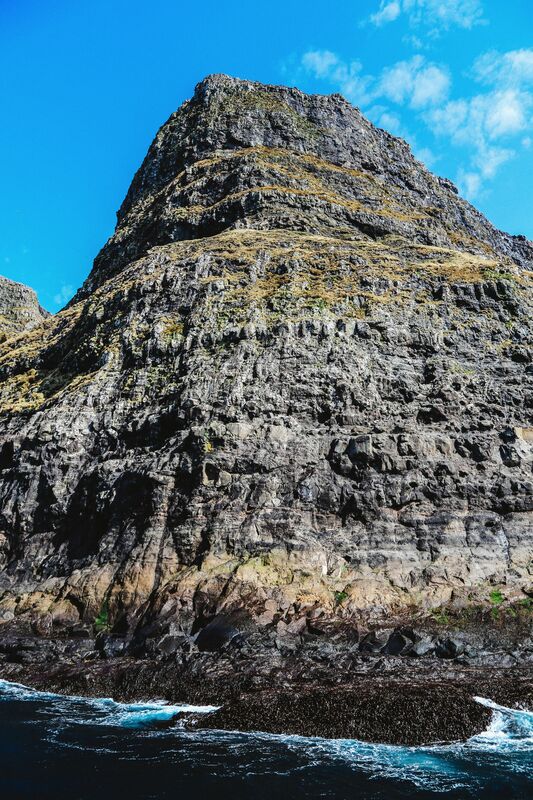 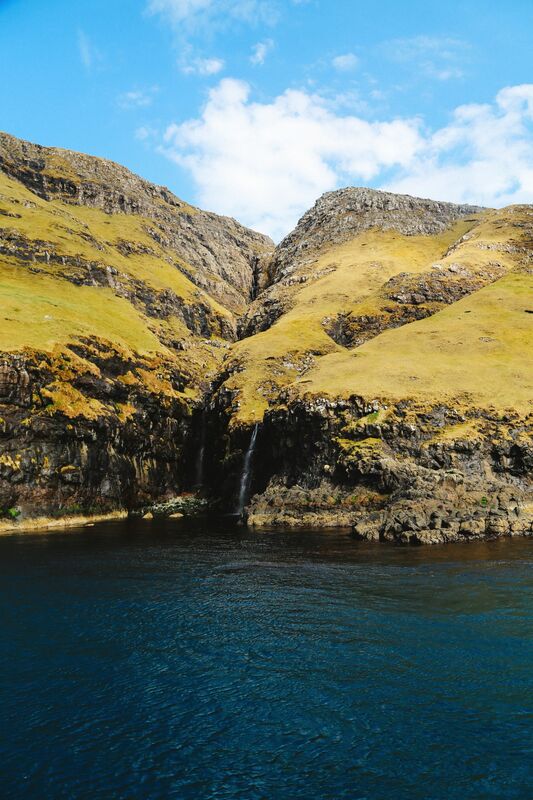 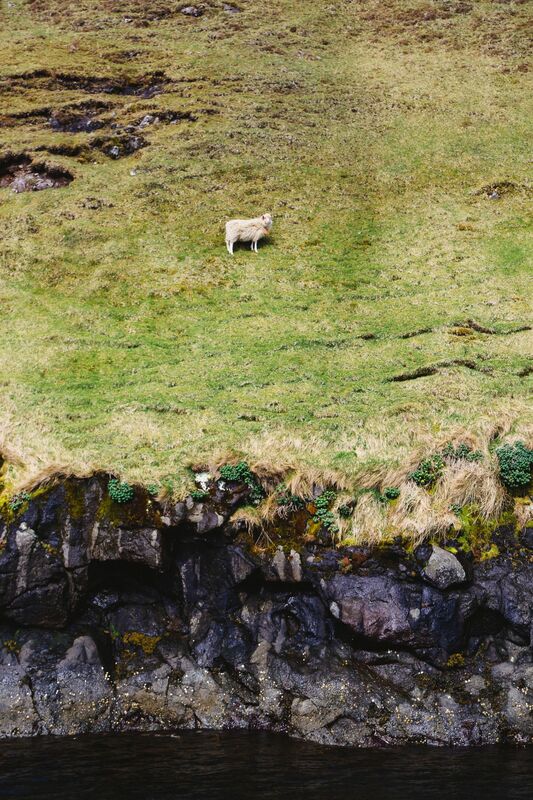 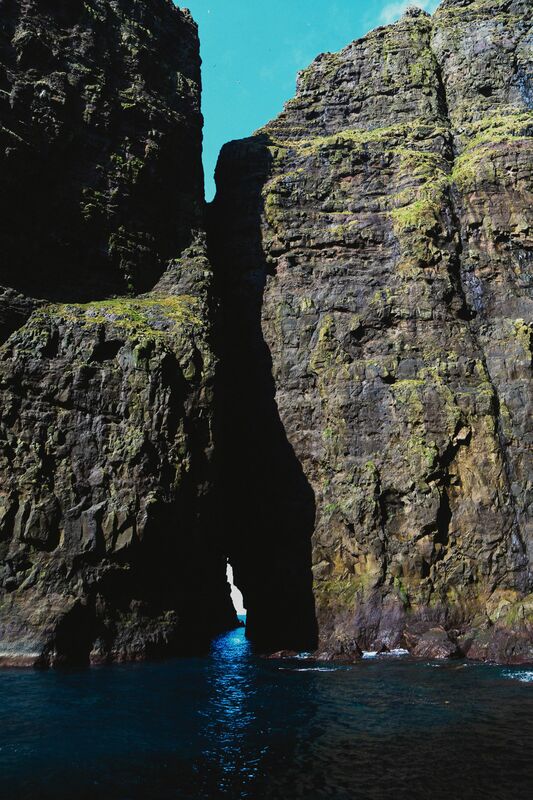 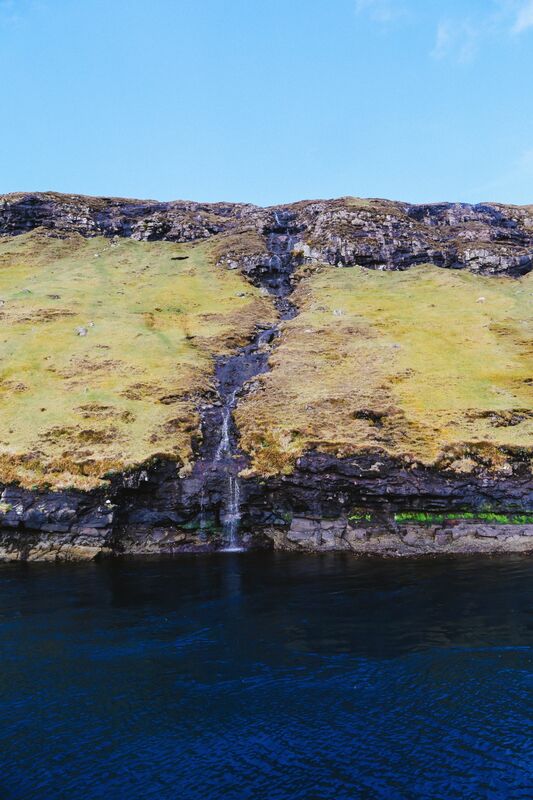 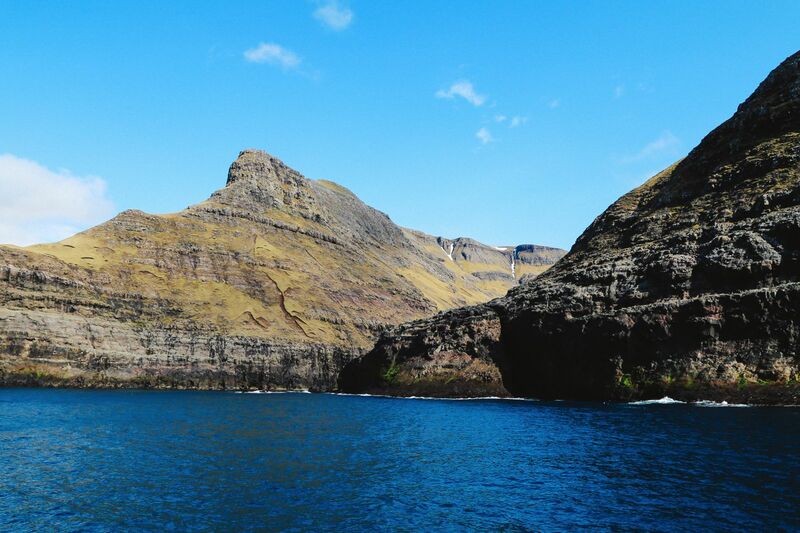 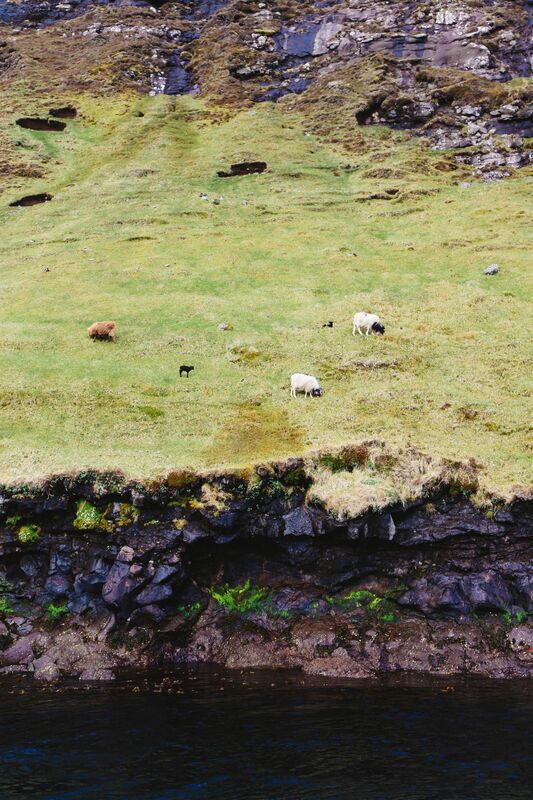 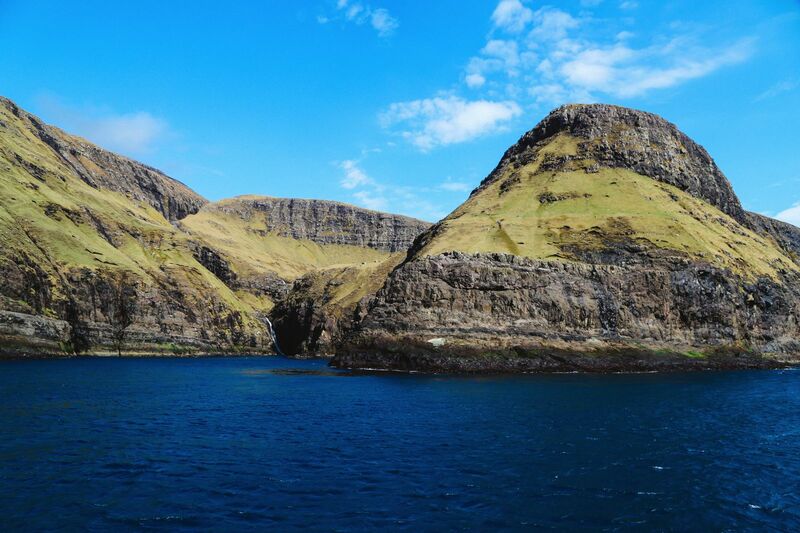 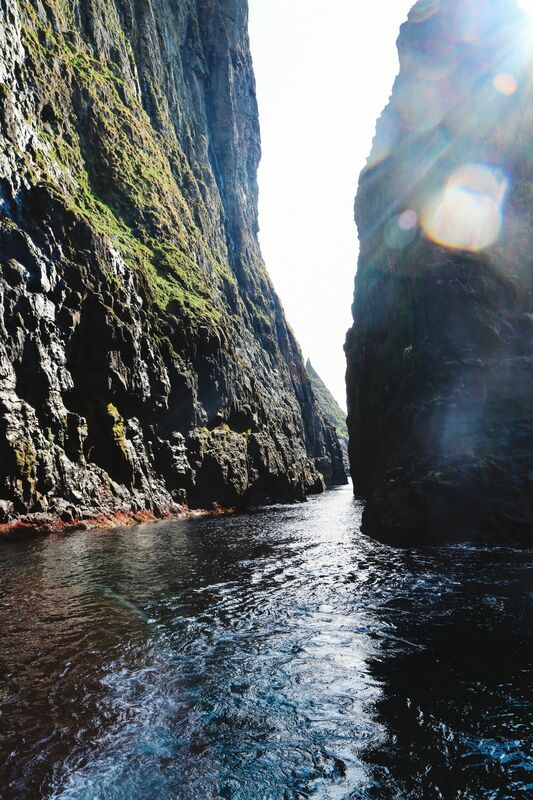 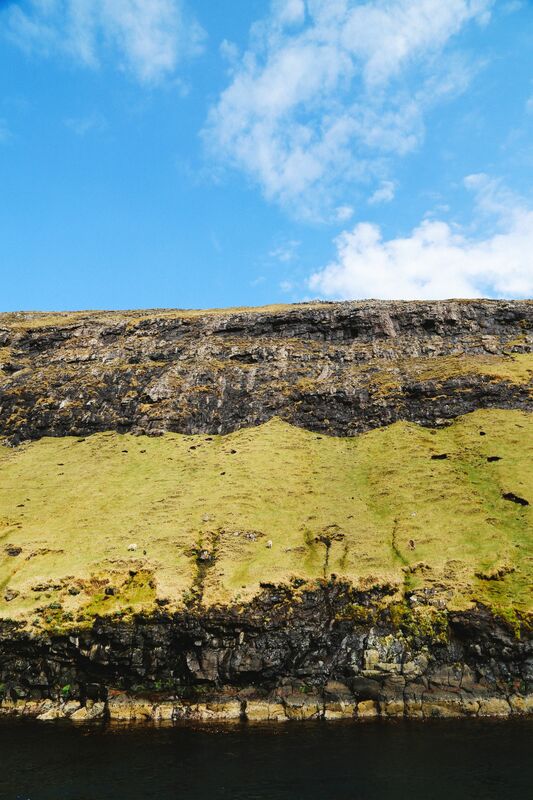 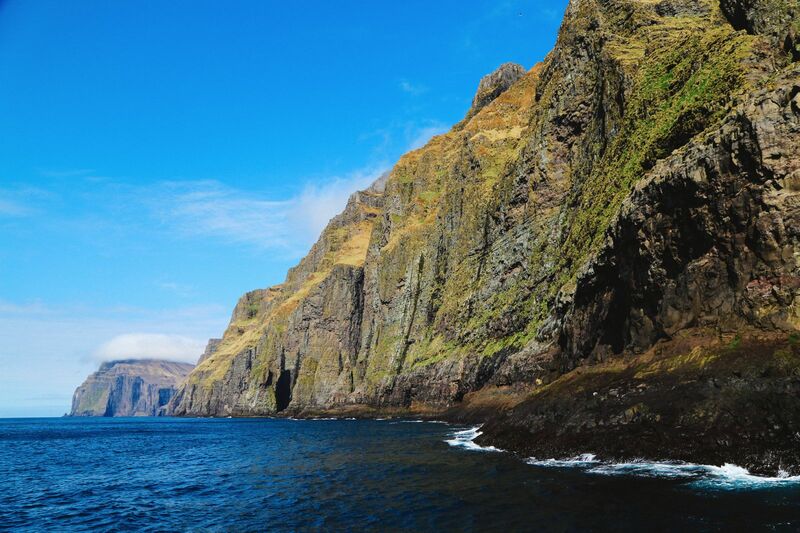 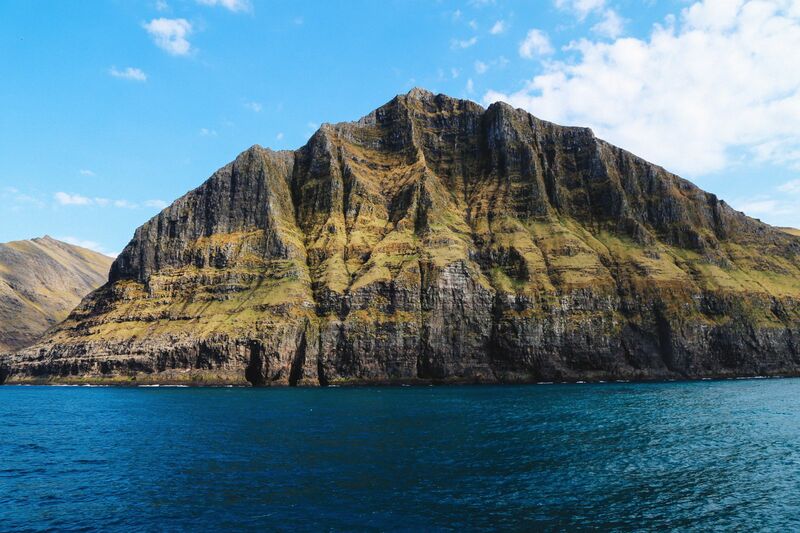 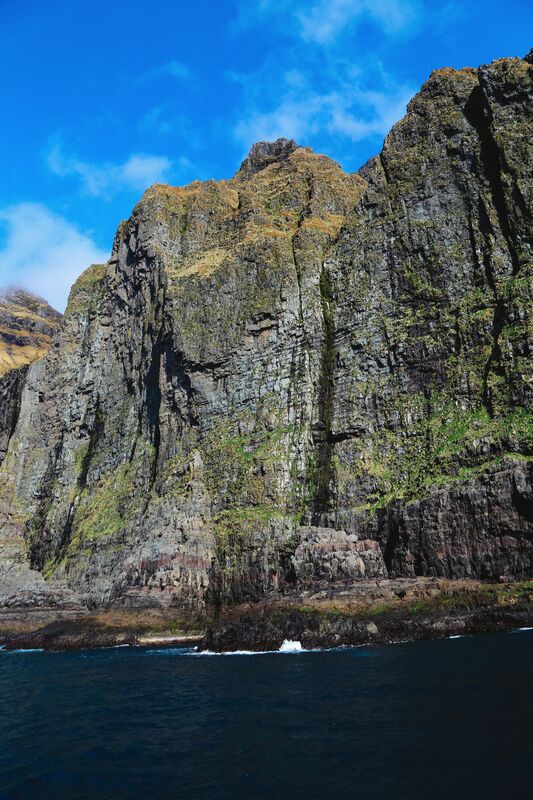 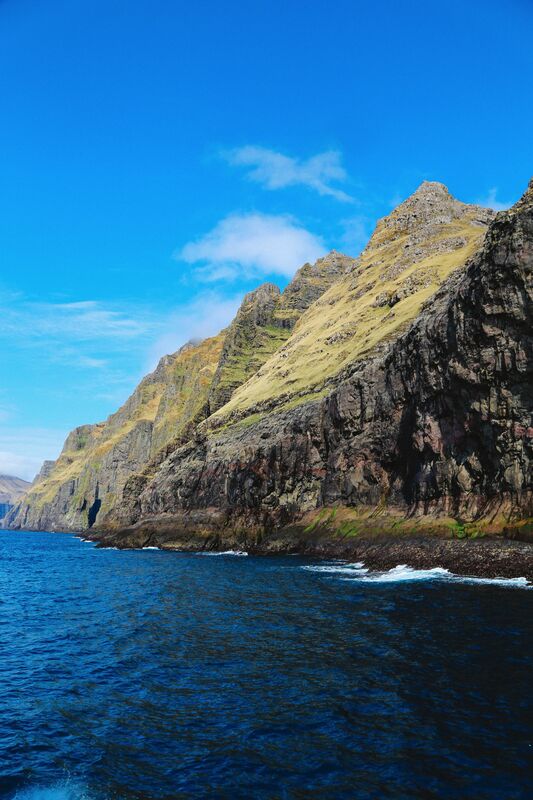 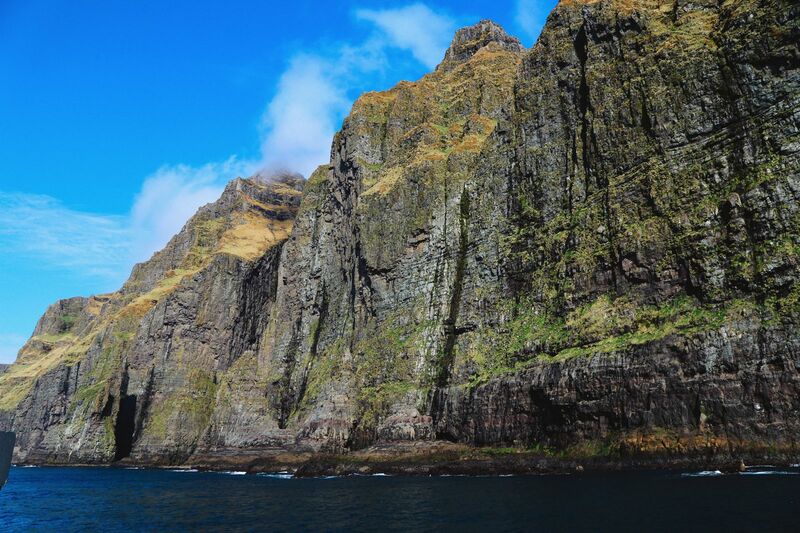 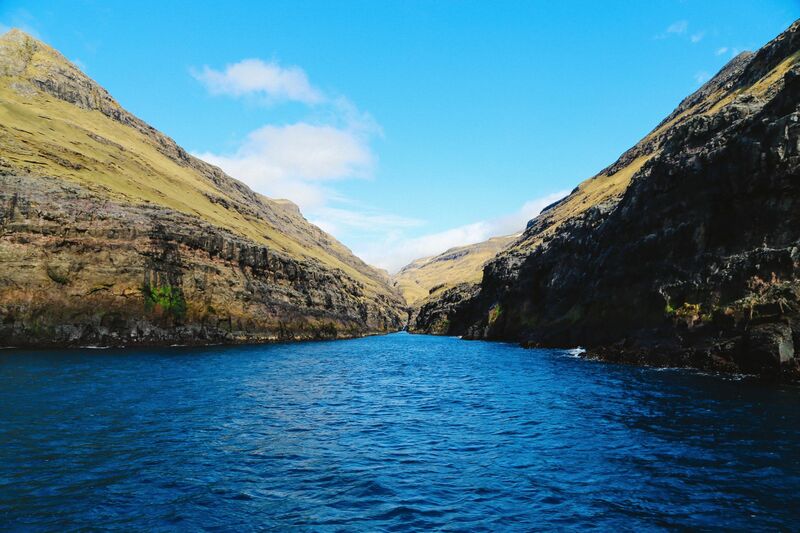 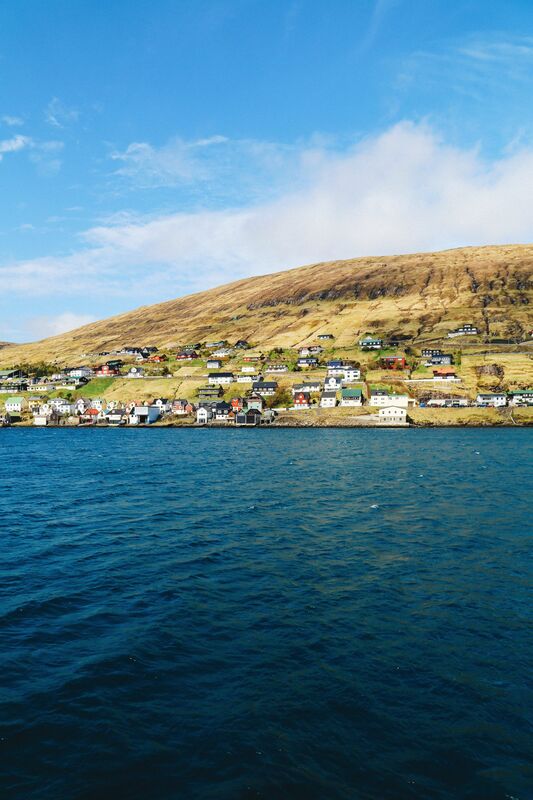 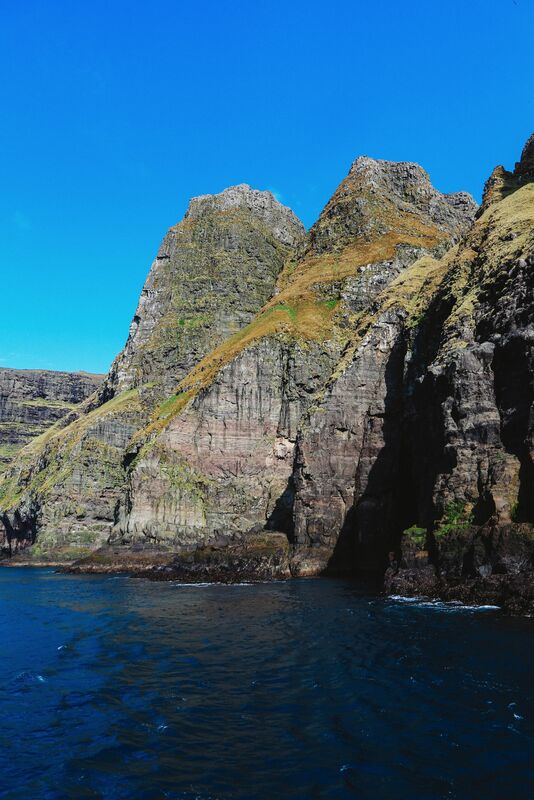 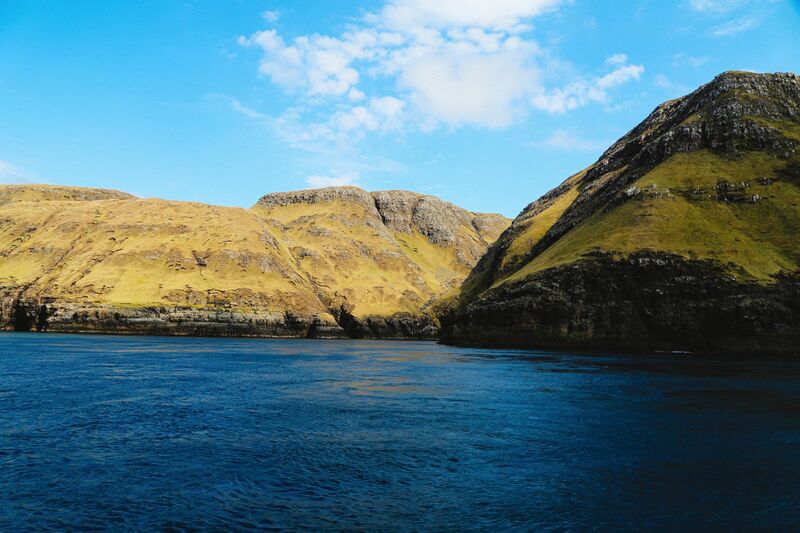 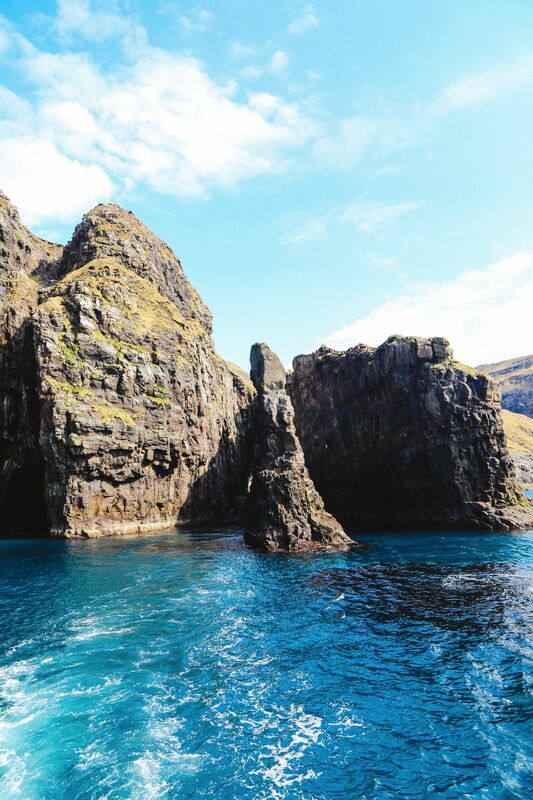 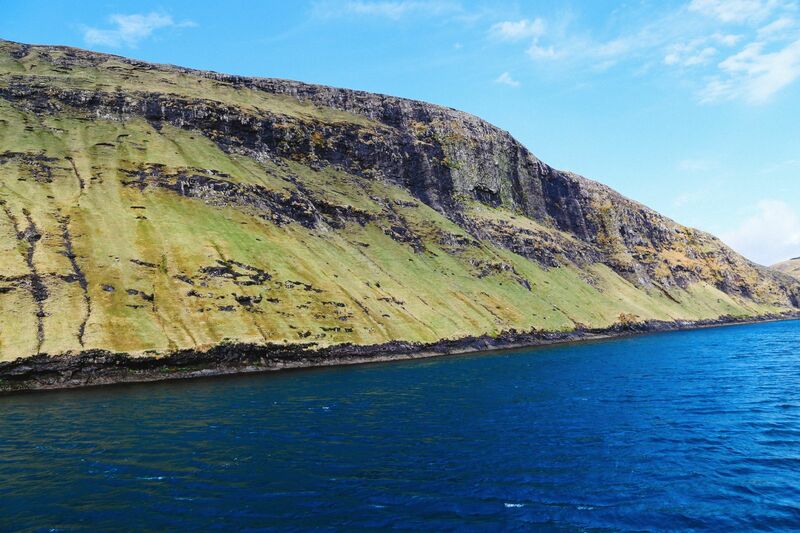 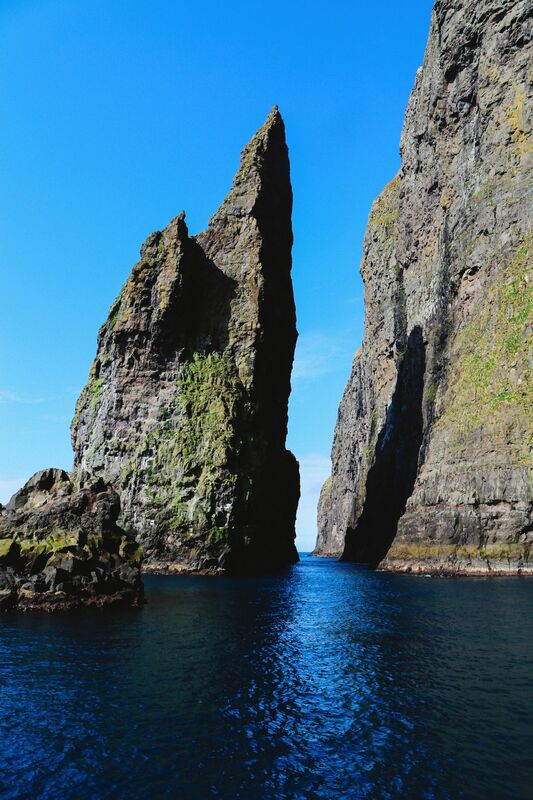 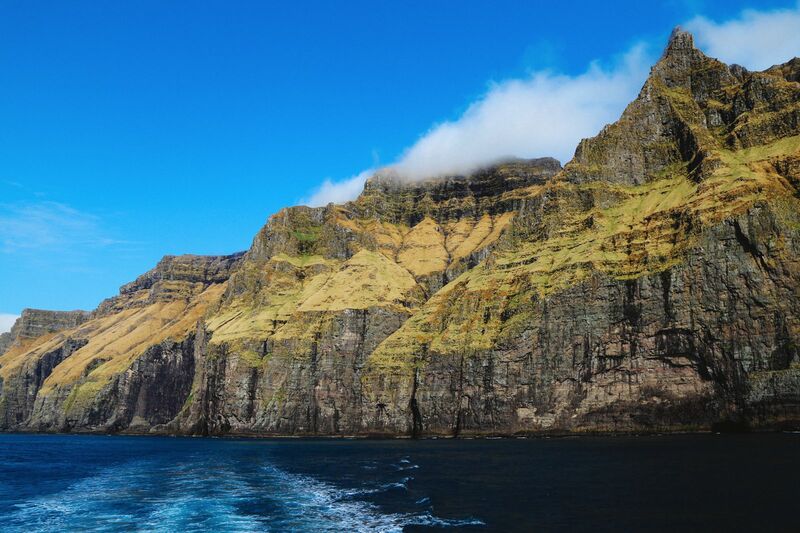 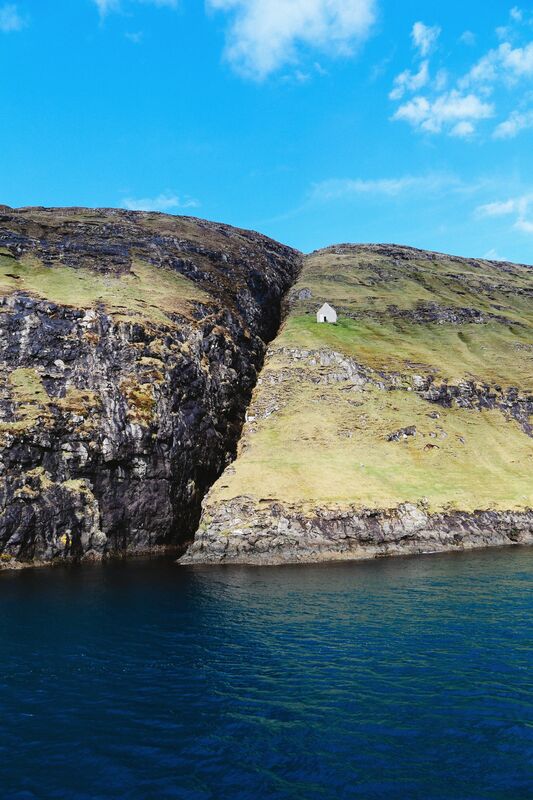 As impressive as the Faroe Islands are on land, they’re even more impressive via boat. 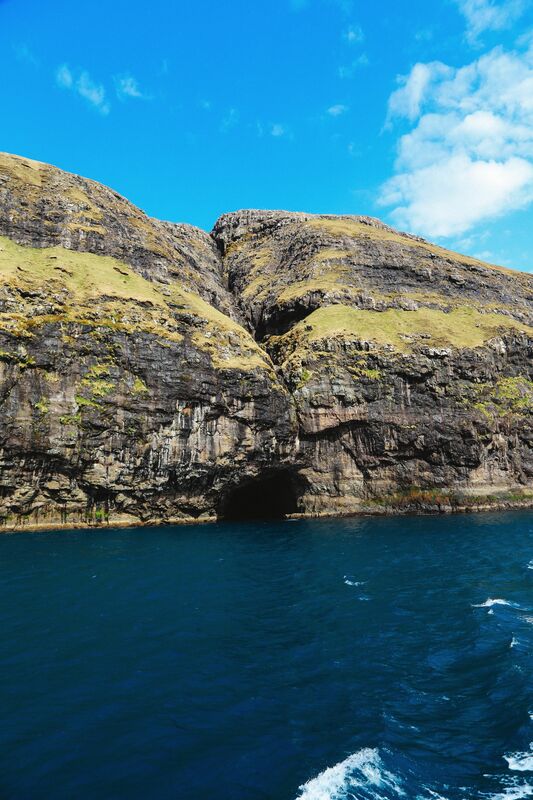 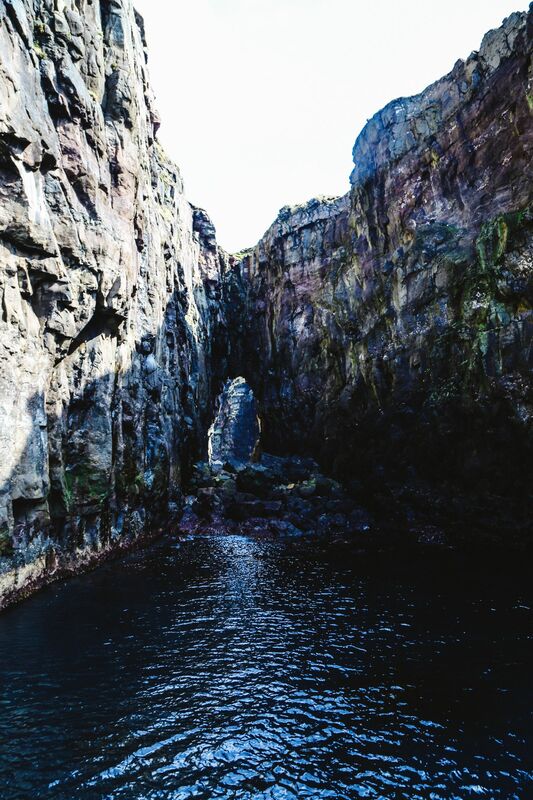 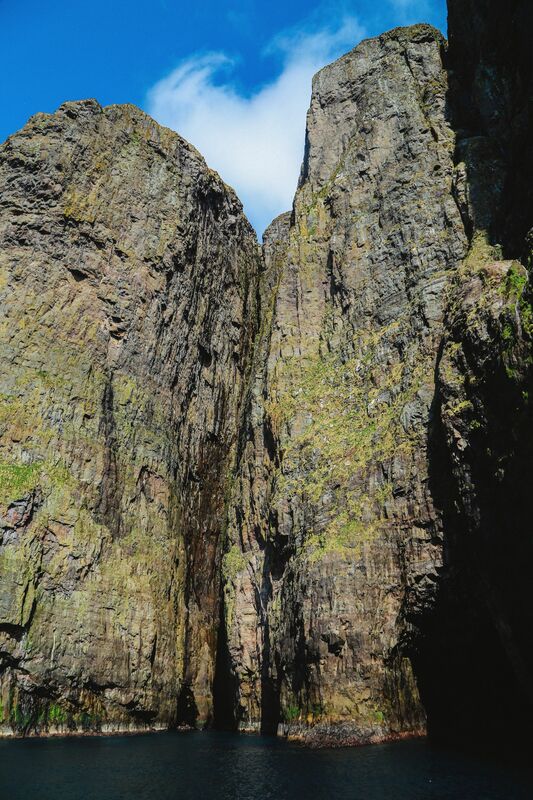 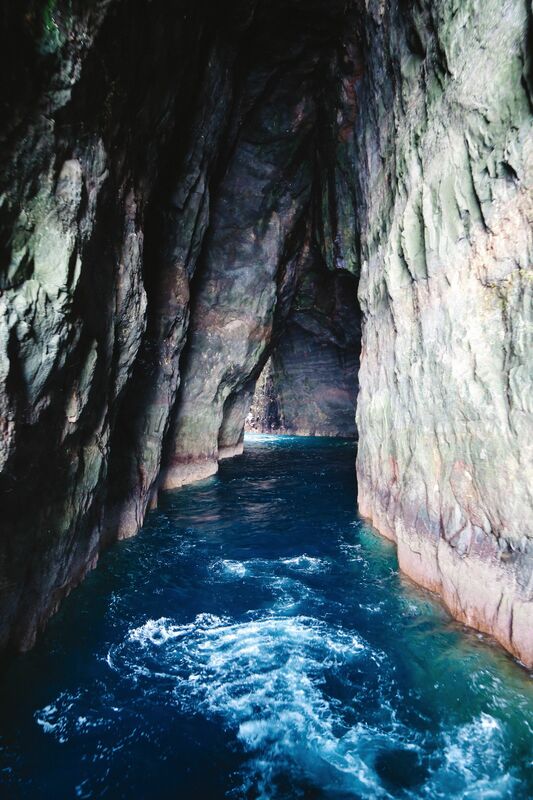 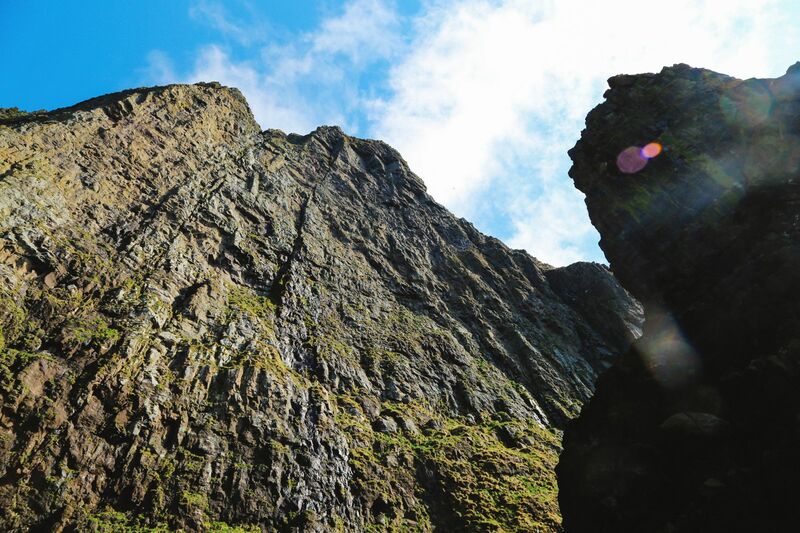 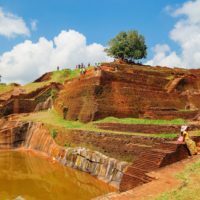 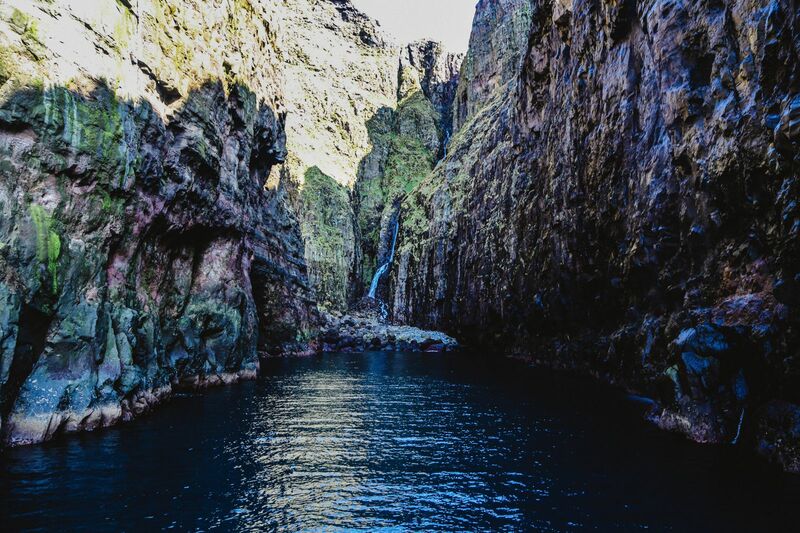 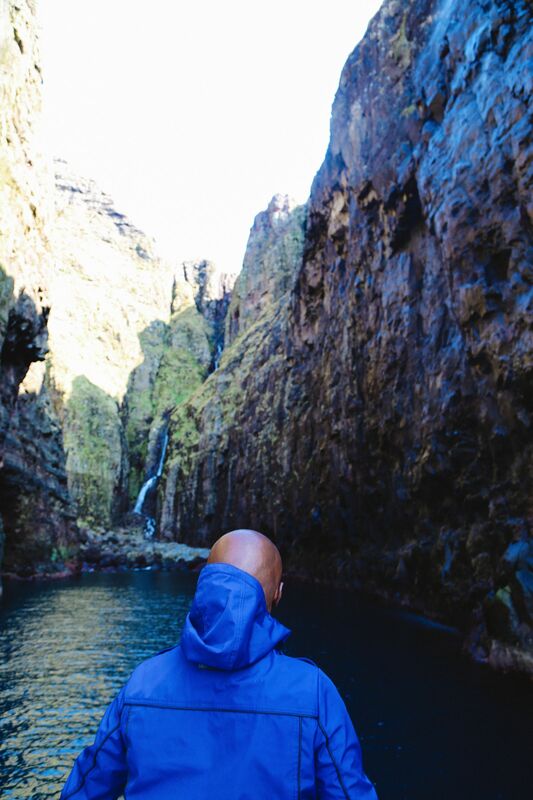 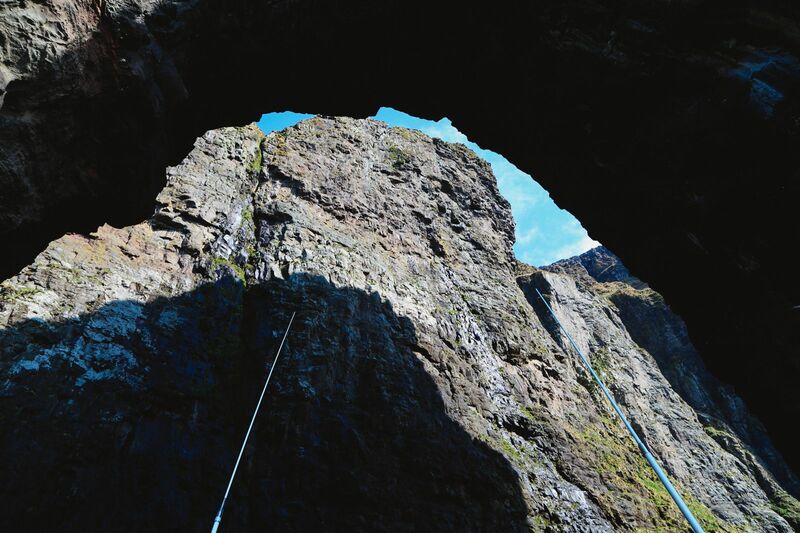 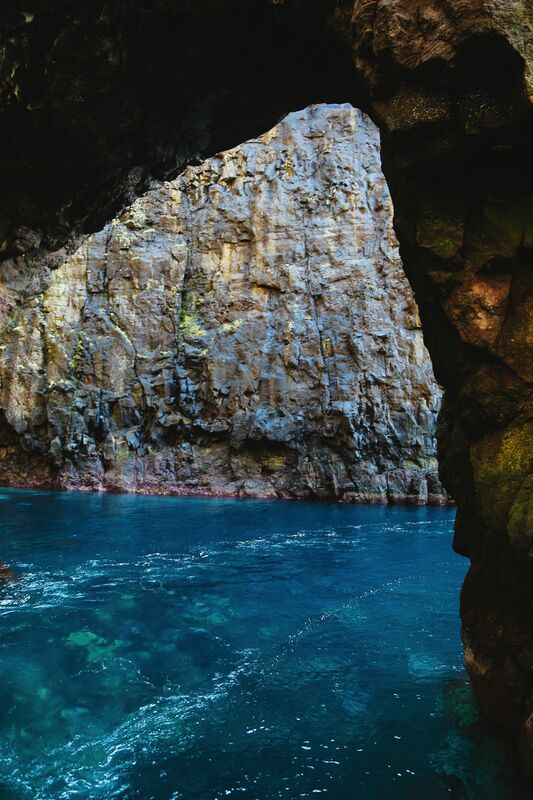 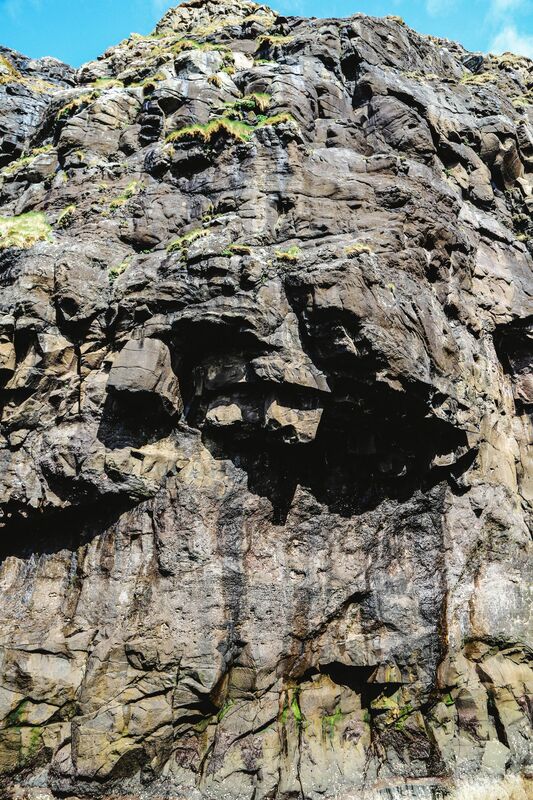 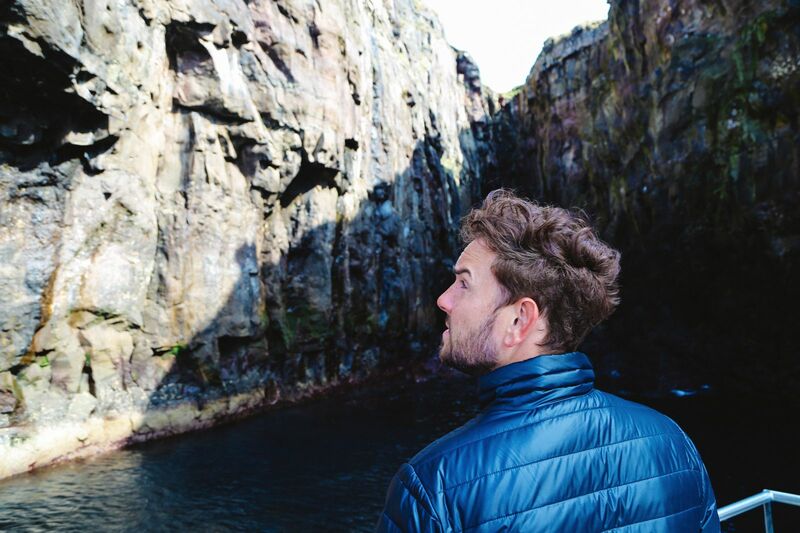 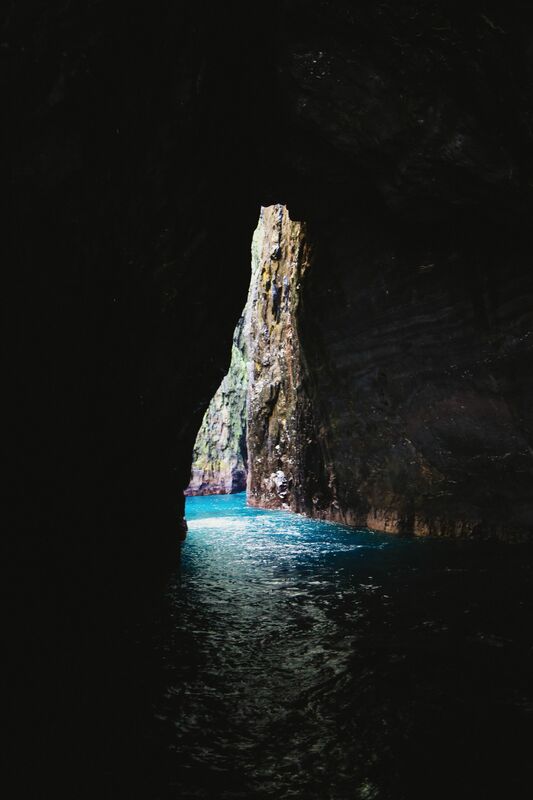 You get to go into caves, cracks and crevices and get a rather unique perspective on these amazing islands. 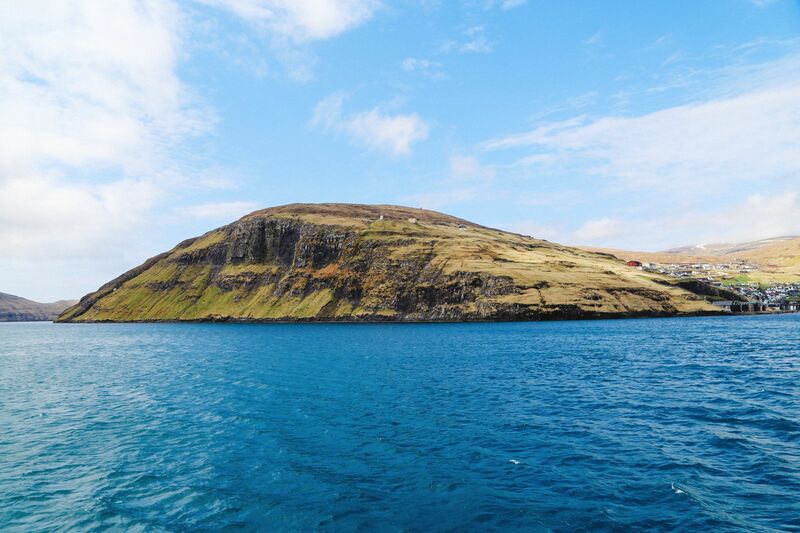 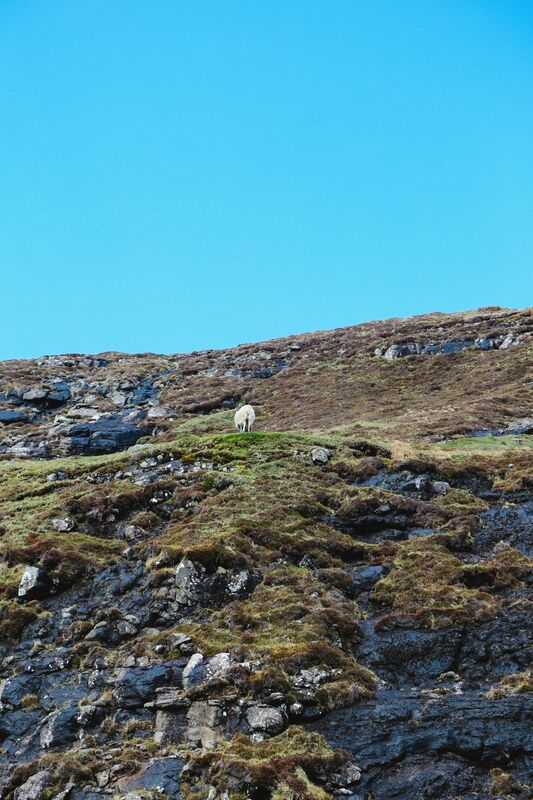 Thankfully as well, the sunshine held out and the island absolutely transforms in the sunshine. 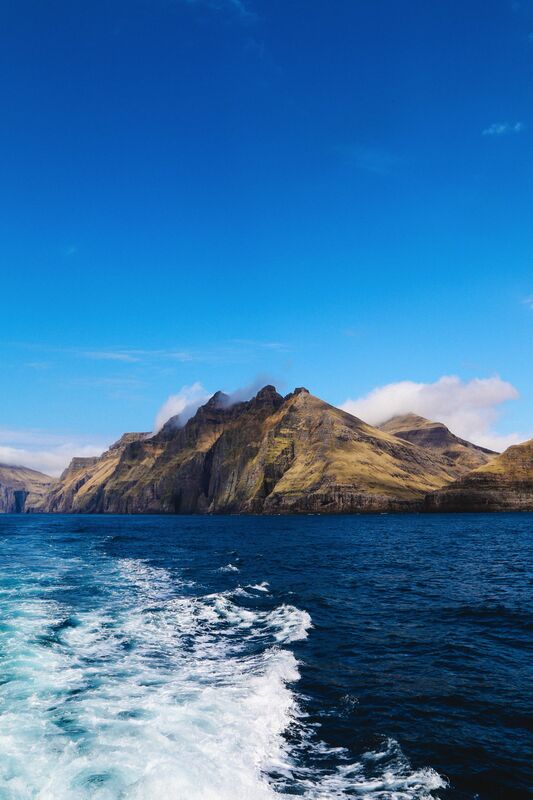 I quite like the islands foggy (they look amazing in the fog) but coming from London, we take all the sunshine we can get! 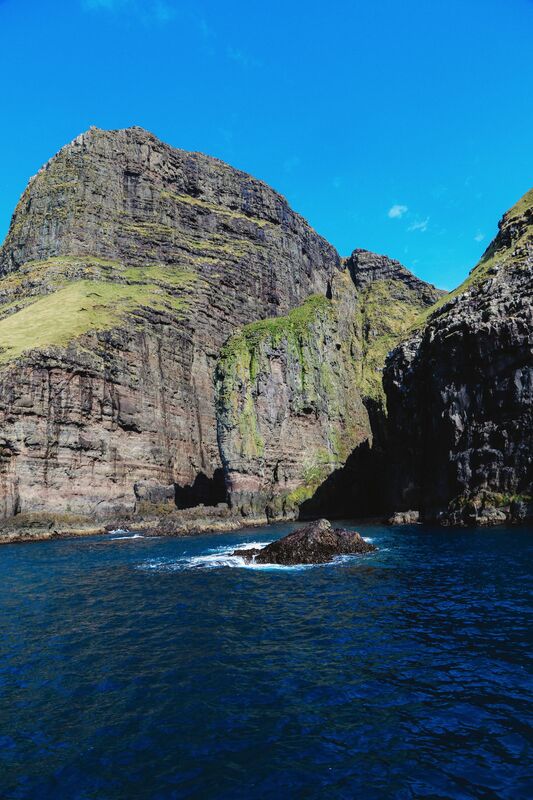 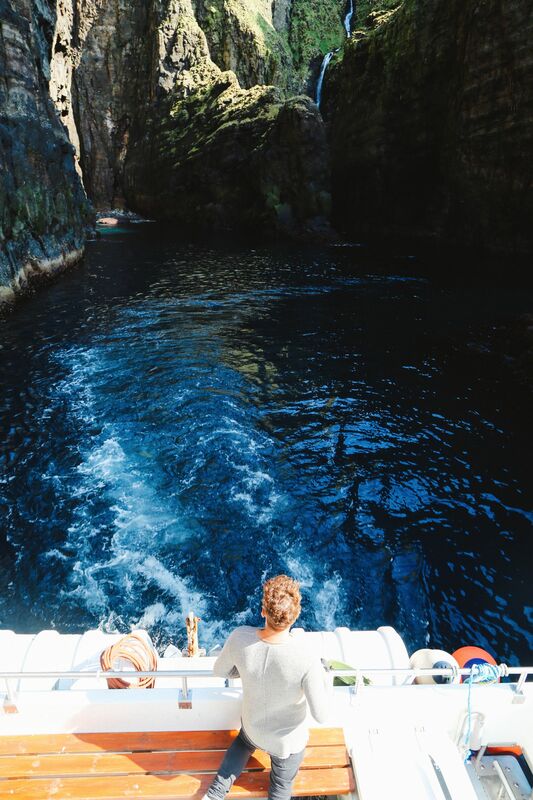 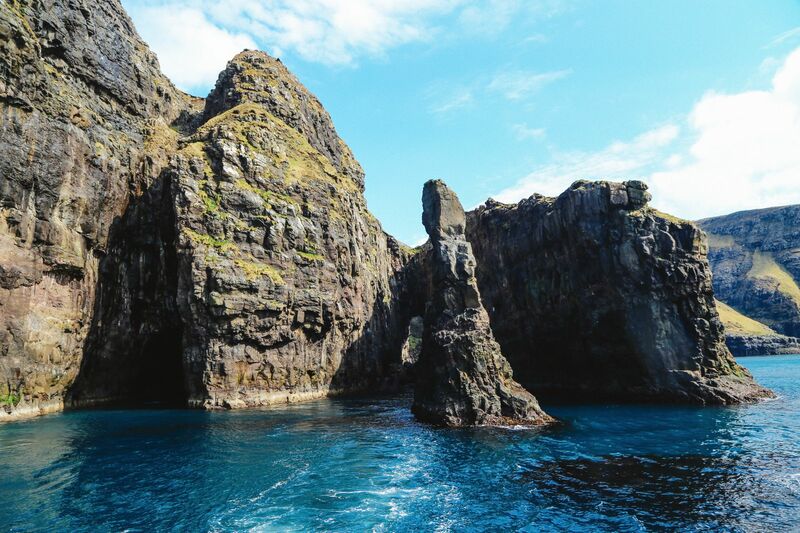 Wandering through the islands via boat, Lloyd and I pretty much kept expecting the Jurassic Park theme tunes to start playing at any moment.If a Triceratops popped it’s head out, while we sailed across, I don’t think I would even have flinched. 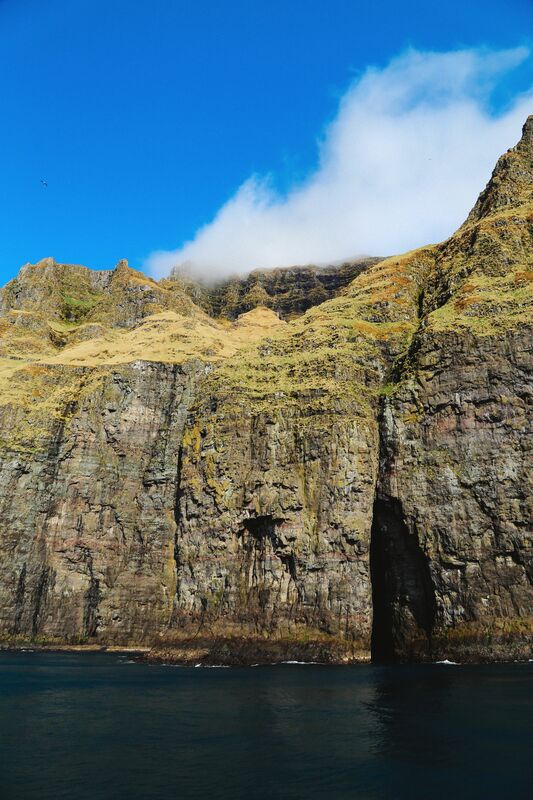 🙂 Also, the cliffs here go from sea to clouds, they’re that high and to be honest, it’s probably the first time I’ve seen anything quite like it! 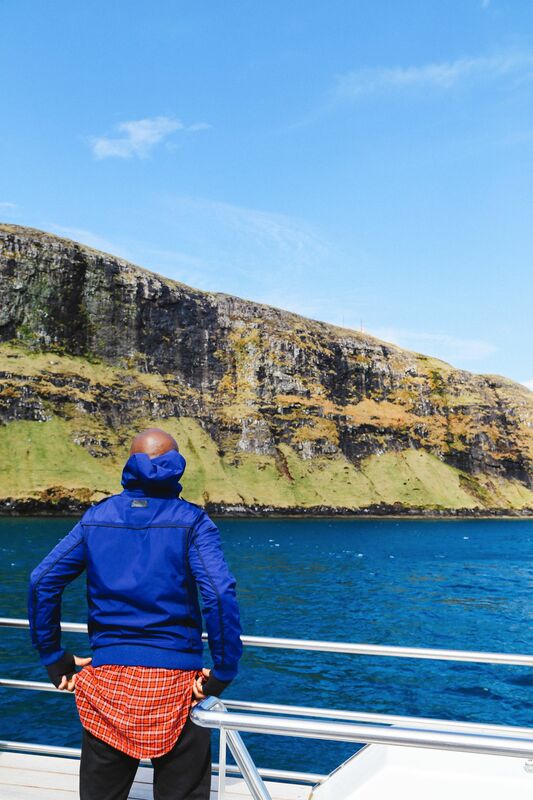 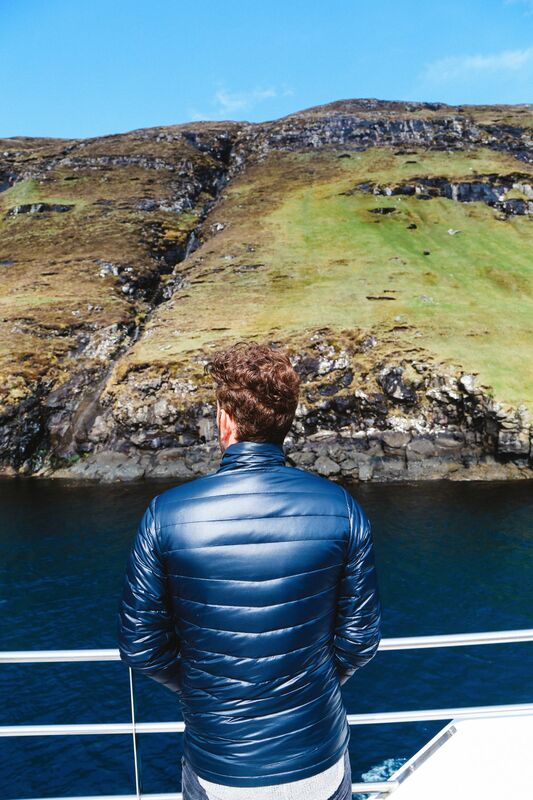 The winds are blistering cold out here so if you do plan on visiting (there are more details on the official Faroe Islands website at www.visitfaroeislands.com) do remember to wrap up nice and warm. 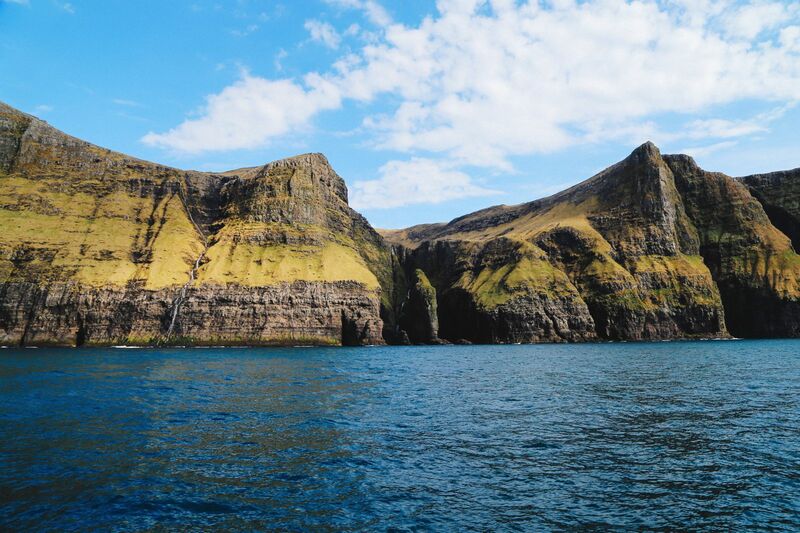 For some reason, I didn’t even think to pack a hat or gloves, staples I would have known to pack otherwise though I would put that down to excitement of finally getting to visit these amazing islands. 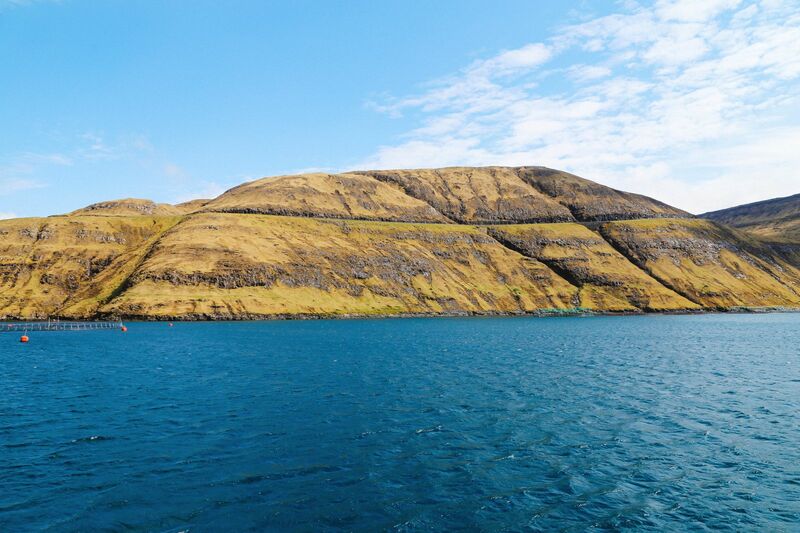 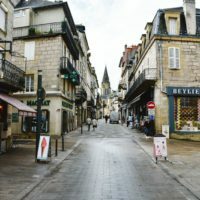 It’s a funny little thing but this is perhaps one of the parts of the islands that I’ve never seen in photos or videos as much yet it’s definitely one part of the island that you definitely should see. 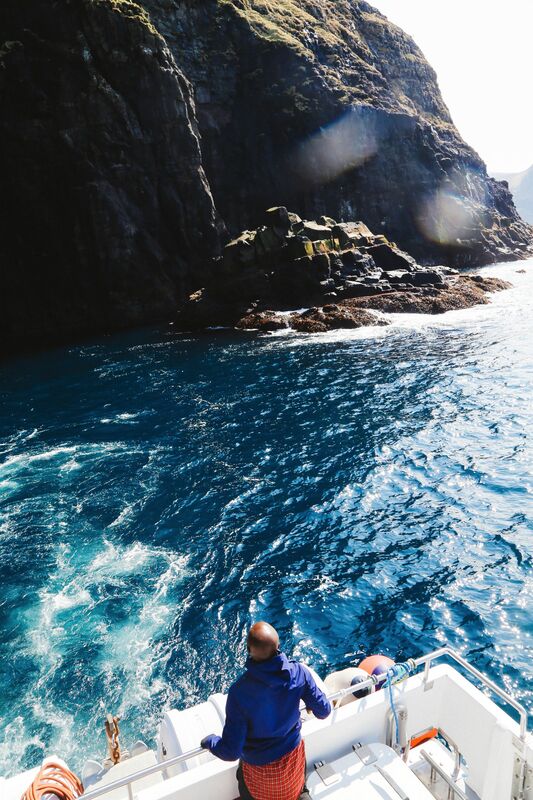 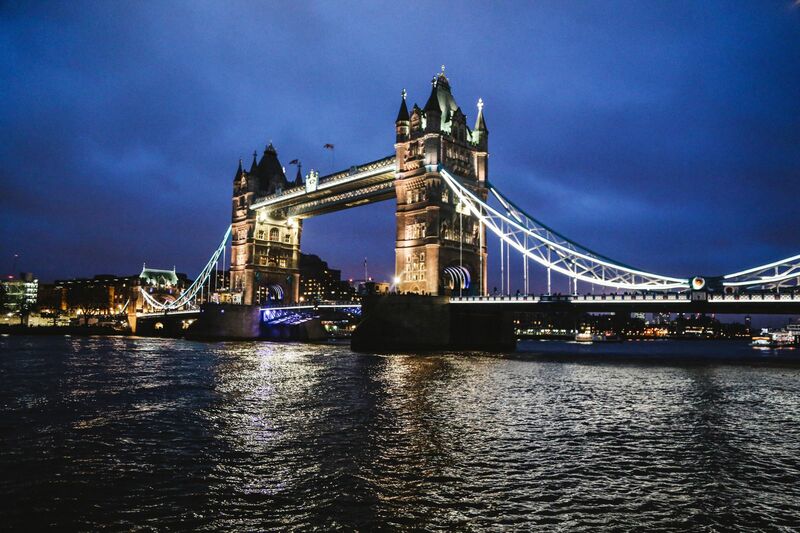 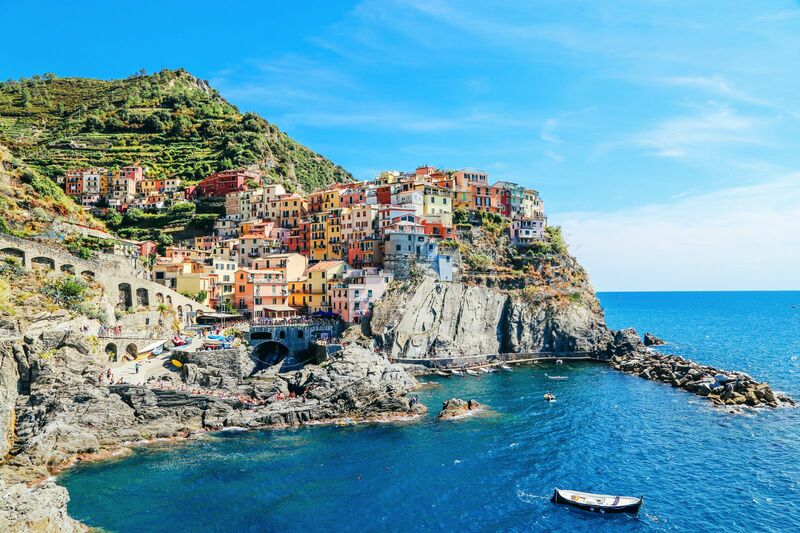 It’s absolutely incredible to experience in person and the clear, crisp sea air is bound to shake off the cobwebs, leaving you ready for your next island adventure!